Welcome to the start of a series! The series is called “The first steps you need to take to become a parent ally” and it covers the crucial things we need to consider, change, plan for and tweak. It’s possible your beliefs about children and childhood have already begun to change and that’s why you are embarking on this path of allyship. And that’s awesome as it is the first step, perhaps even the most important one. So much of modern parenting is based on beliefs that have risen out of an industrial, punitive societal structure. For much of recent history we’ve required humans that do their job without making a fuss. People that wake up, play their role in society without complaint, and then go to bed, ready to do it all again the next day. Of course, there have been outliers in history; the creatives and adventurers, the rebels and changemakers. But too many and the productive (and unfair) world of our forebears would be upset. So parenting reflected all this. We raised children to be seen and not heard, to respect their elders and do as they were told. These days, while there are folk that long for the good old days of Lords, Ladies and Peasants, with everyone and everything in it’s place, most of us have come to understand that too much inequality and too much tyrannical leadership leads to problems. Most self-respecting occupants of 2017 appreciate creativity, social justice, innovation, human rights and relationship. Yet our parenting is still informed from this stiffer, controlling age. The concept of being allies to our children isn’t too revolutionary. It is really just an extension of many modern values. Parent allies are people that have managed to shift the old child raising creed to a fresher one. Depending on our own upbringing, what corner of the world we were bought up in, the journey life has taken us on so far, our preconceptions will be different. However, here are a few that seem to be common. Leads to: manipulative behaviour management techniques such as reward charts, bribes. threats. Also leads to stressful parents and disconnected parent-child relationships as parents feel intense need to control other human beings and feel judgement when child will not fit into a certain box. Should shift towards: A parent’s role is to provide the supportive environment that allows a child to blossom into who they are. Shifting this preconception towards something less controlling and more supportive can feel liberating. Human aren’t designed to control one another, we are designed to be in relationship with one another. Rather than seeing ourselves as trying to mould our children into the right shape using behaviour modification techniques, we must trust that by modelling and gentle communication we can help them navigate the tricky aspects of life. A new picture: See yourself as a travel guide, taking tourists from one culture to a completely foreign one. With respect and dignity, humour and patience you guide your child, supporting them, providing information, showing understanding when they make mistakes. Leads to: Children being degraded and disrespected in everyday life – told to “shush”, spoken over, shouted down. Potentially leads to dangerous circumstances because children are far more hesitant to speak out against something they know really shouldn’t be happening to them. 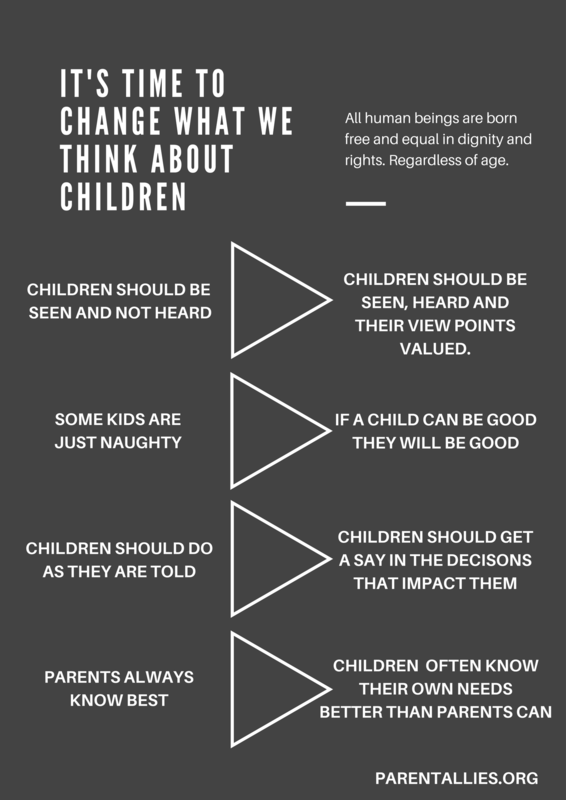 Should shift towards: Children should be seen, heard and their view points valued. The phrase “children should be seen and not heard” is often spoken with irony these days, but actually a quick trip into the library or on the bus quickly reveals how much it subconsciously informs the way we treat children. We bring kids to places where their natural energy isn’t welcome, we ask them to quieten down and respect the environment, and when they don’t we get angry; outraged that a mere child might dare to exert their will or needs. A new picture: See yourself as the coach in the sidelines as your child takes to the stage. You give her thumbs up, whisper the first word of her line when she seems forgetful. You are enabling your child to have a voice, to bring the gift of herself into the world. Leads to: Children being burdened by a label, adults trying to manipulate or control a child’s actions or behaviour with words, possibility of long term impacts such as children needing positive, external feedback rather than being intrinsically motivated. Leads to: Children not who are unable to listen to their bodies or trust their own needs, parents forcing children to do things that don’t work for the child, the trusting relationship between parent and child negatively impacted. Should shift towards: Children get a say in things that concern them. Children are full human beings with feelings and hopes, are often well positioned to understand their own needs and should be supported to know their own needs. We have bought into a myth that only adults can know what a child needs, and that children must obey whatever is handed down to them. This is problematic because often adults cannot possibly know what is wrong. I remember a time that my one year old nephew was screaming and crying his head off in his car seat. Eventually we listened to his cries, and observed him hitting his foot. He was trying to tell us that his toe was bent under his foot, inside his shoe. This is an extreme example, but there are small examples like this everyday for children. The child that knows he is hot being forced to wear a jumper. The child that knows she feels queasey being forced to eat more of her dinner. It is also problematic as we are teaching children to obey mindlessly, simply to do what they are told by a person in authority. 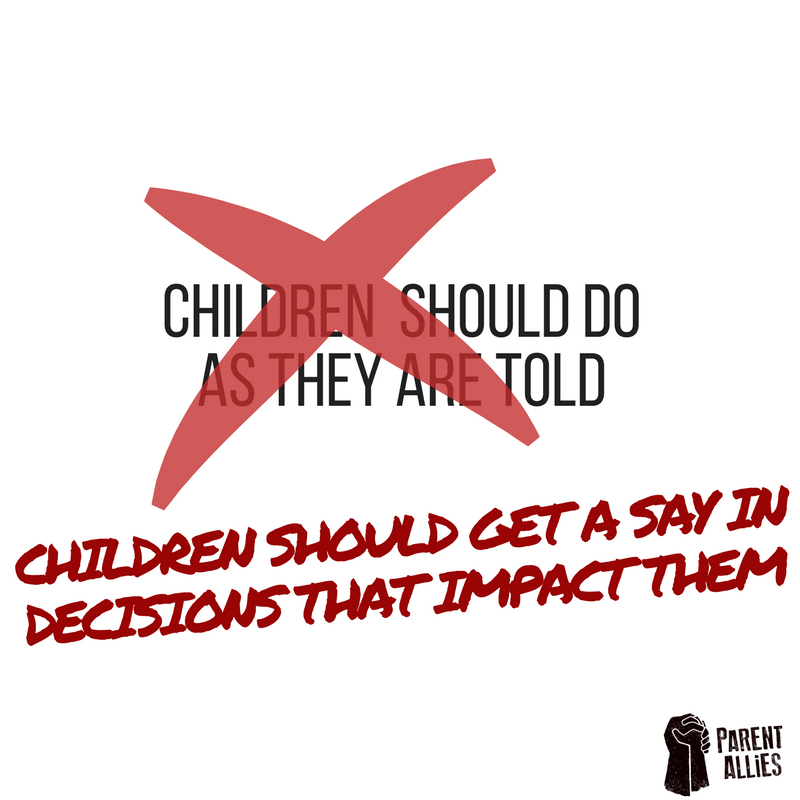 Instead, we want to raise a generation of children who can look at decisions sensibly, who won’t accept bad decisions because someone is more powerful than them. A new picture: I want you to imagine a circle of people, sitting down, discussing. They have a talking piece which is passed from one person to another. Everyone gets to say what they are feeling, but some people choose to sing a song, or paint a picture to get across their point. Everyone contributes and everyone is listened to as equals. After some time a decision is made that everyone likes, people leave the circle feeling heard and valued. This circle could be you and your children or all adults and all children in the world – each person, no matter their age and status, a joyous participant. Each one of us has our own set of preconceptions we are carrying around with us. They are based on our upbringings, our life experiences, our schooling. Now is a good time to consider how well these are serving us, our children and our families. And if they are not serving us well, let’s apply that good ol’ mantra: Out with the old and in with the new! In the coming weeks we will explore all the important building blocks of being a parent ally, covering all sorts from self-care to punishment, reward charts to manners. Stay tuned! The theory is wonderful and plent of sense for me. But due my own childhood I found really difficult to deal with certain behaviour and especially if it happens while we are with more people judging my motherhood, my daughter character and our family point of view. I try to do my best, but I found it tricky and a feeling of loneliness grow inside me. To be honest, I don’t have time for staying on internet, so how I am supposed to do it? Sometimes I feel really depressed and angry and frustrated. Do we will find strategies to fight and win against those feelings in the following post? Thank you for all you effort. I’m pretty sure you will help lots of children.